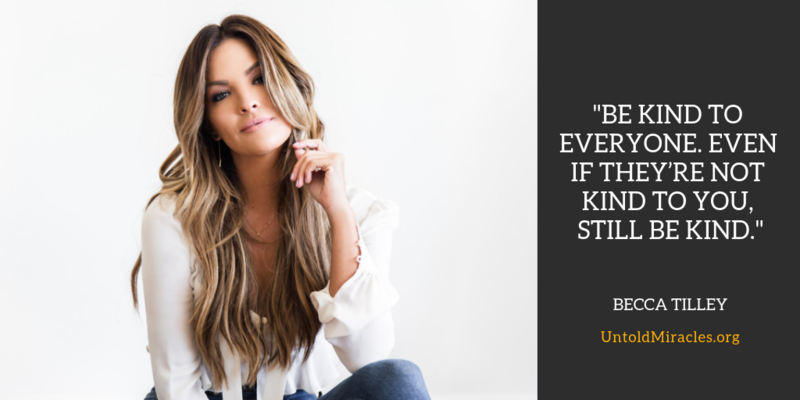 Media influencer and lifestyle brand entrepreneur Becca Tilley discusses the miracles she’s seen in children’s hospitals, her award-winning podcast, and what it was like to date on national television. Becca Tilley is best known for appearing on ABC’s hit reality show “The Bachelor” twice in 2015 and 2016. Since the show, Becca has risen to fame with her lifestyle blog, her successful YouTube channel, and her award-winning podcast, “Scrubbing in with Becca Tilley and Tanya Rad,” where she covers everything from dating and relationships to music and her favorite tv shows. Becca is a social media influencer and works with brands and charities all over the world. How Becca developed a thick skin and learned to not let the opinions of strangers bother her. About miracle kid Carter that Becca met at Children’s Hospital Orange County who inspired her with his resilience. What Becca’s favorite episode of Grey’s Anatomy is and which celebrity she would go on a date with. What the biggest challenges and successes are in producing her own podcast.